To help steer future SDS/2 software development and ensure Design Data is instituting enhancements that better meet the needs of a majority of users, the company has implemented OpenMind voting software. 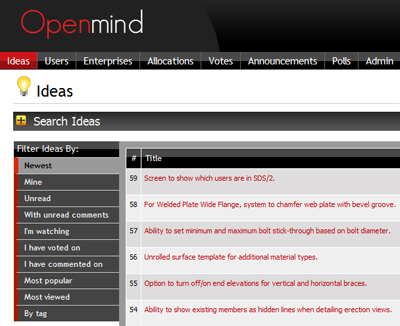 OpenMind allows current customers to vote for enhancements they would like to see in SDS/2. The initial list of enhancements (or Ideas, in OpenMind terminology) was pre-populated from previous customer requests; however, current customers can add to the list with their own Ideas. When creating an Idea, the customer must select one of five SDS/2 product categories: SDS/2, SDS/2 Connect, SDS/2 Engineering, SDS/2 Mobile Status, or SDS/2 Viewer. To ensure your Idea garners support from other SDS/2 users, be as specific as possible when describing your Idea. Images are encouraged, but are not required. OpenMind voting software gives customers the opportunity to suggest and vote on enhancements they would like to see in Design Data products. The Ideas list can be searched or filtered based off keywords or tags added when the Idea was created. Customers can vote for an Idea simply by clicking the Vote for this Idea icon; users can cast multiple votes for an Idea. If Design Data is working on or plans to implement an Idea, that Idea will be tagged to a release. Once an Idea is tagged, it can no longer be voted on, and any votes cast for it are reallocated. Customers can also remove a vote from an Idea at any time. A box on the right of the OpenMind screen displays how many votes a company has remaining. 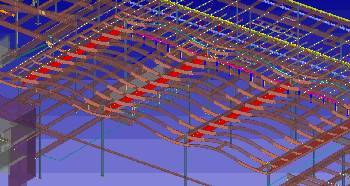 SDS/2 Connect and Revit Structure have tools that can help streamline the initialization process. SDS/2 Connect's Library and Revit Structure's templates will reduce the time required to initialize a project. 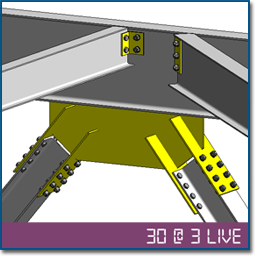 In June 14th's 30 @ 3 LIVE, you'll learn how to use these tools properly; an in-depth question-and-answer session on all things SDS/2 Connect will follow. If you've missed any of the previous series, you can now view them via 30 @ 3 LIVE (Replay). During June, Design Data is offering special product promotions to those who follow us on Facebook and Twitter. 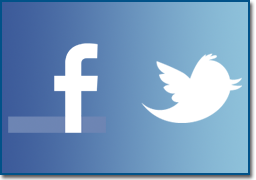 Design Data's Twitter account and Facebook page are also excellent resources for reading the latest industry news, expert articles, technical tips and more. Click here to follow us on Twitter. To like us on Facebook, click here. Design Data will be exhibiting and presenting at the Revit Technology Conference North America 2012, to be held June 28-30 in Stone Mountain, Georgia. 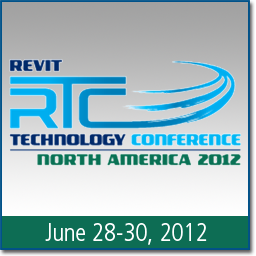 RTC is a unique, independent conference, covering all things Revit / BIM. As a "by users, for users" event, RTC is the best place to get unvarnished advice from the people who use the technologies to drive their businesses, and the industry as a whole, forward. Design Data's Doug Evans and Michelle McCarthy will be presenting on "Designing Connections within Revit Structure to Drive BIM Models to Fabrication" at 4:30 p.m. on June 28th. Atlantic Steel Detailing Services, LLC, was founded in 1994 and has since grown to a nine-detailer operation for structural and miscellaneous metals. Atlantic's six SDS/2 stations, originally implemented in 1996, give the company a capacity to handle projects up to 10,000 tons. Atlantic completed the Forestville School in Bristol, Conn., a demanding project that incorporated many curved members including "magic carpet" roofs and gymnasium trusses with arduous roof pitches. Atlantic has recently stepped into the marketing arena and is focusing its efforts on developing strong relationships with leading steel fabricators in America. "Continual growth by way of quality service is what we envision for the future of our company," said Dave Angelini, the company's president. SDS/2's available tools — such as CNC, KISS, BIM, RFI Creator, Status Display, and Report Writer — have helped Atlantic excel in customer service and allow detailers to work at a much higher and more efficient rate. "SDS/2 has helped put Atlantic Steel Detailing Services on the map," said Angelini. "The accuracy in which SDS/2 models and details is second to none." Angelini also credits SDS/2's 3D functionality for saving Atlantic valuable detailing time. "Working in a 3D environment such as SDS/2, we're able to view in 'real space' what scenarios arise, from bolt clearance issues to material interference. This saves much shop and field work from having to be revised due to misinterpreted connection details."